I Need Laser Dentistry. What Does that Mean? Have you recently visited your dentist? Did he recommend laser dentistry? If so, you may be a bit confused as to how the treatment will benefit you. It is only natural to have questions about it; however, rest assured that the use of lasers now offers more precise and accurate results when compared to more traditional methods. This advancement in dental technology improves an array of procedures, from cavity detection to the treatment of periodontal disease. Lasers have been used in dentistry since 1990 as a safe and effective alternative to traditional methods; however, they have only recently gained traction to hold a common place in many current procedures. A laser is a narrow, highly concentrated beam of light that targets a specific area of hard or soft tissue to cause a reaction, such as removing or shaping a tooth or gum line. This offers a wide range of benefits, such as a reduced risk for bleeding and infection as it sterilizes and cauterizes the tissue as it cuts. This promotes an improved healing time with fewer complications while also improving tissue regeneration. In addition, there is less risk for damage to nearby tissues as it precisely targets the treatment location. It is also less invasive because no sutures or scalpels are needed. In fact, many procedures can now be performed without any anesthesia. Lasers can now be used in an array of dental aspects, such as the detection of cavities. A low-intensity laser can quickly identify weak spots in the enamel, allowing your dentist to strengthen them to reduce the risk for cavity development. They are often used for crown lengthening procedures to enhance the shape and proportion of the teeth. They are beneficial for the treatment of soft tissues as well, such as during periodontal therapy to reduce pocket size in the gum tissue. However, they can be used for cosmetic purposes, like resolving gummy smiles by removing excess tissue. They are often used when performing a biopsy to help promote an accurate diagnosis and treatment plan. Depending on your treatment plan, you may not require any anesthesia. The dentist or hygienist will use a small hand-held device that emits the laser beam to cut away hard or soft tissue. This resolves the need for a drill during hard tissue treatments, while eliminating the need for sutures or a scalpel during soft tissue procedures. Overall, you benefit from enhanced results and a quicker recovery time with minimal discomfort. When it comes to dental care, technological improvements, like lasers, promote the services you receive. To benefit from high-quality care, choose a dentist who embraces theses advancements. Silver Creek Dentistry uses the best dental technology that is combined with the qualifications and training of our highly-skilled team to provide full services to the community. 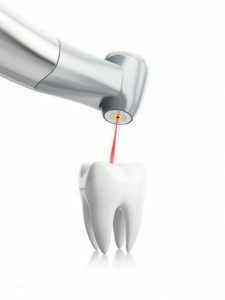 If you have any questions about technological advancements, like laser dentistry, contact our office today to speak with a member of our team. Comments Off on I Need Laser Dentistry. What Does that Mean?